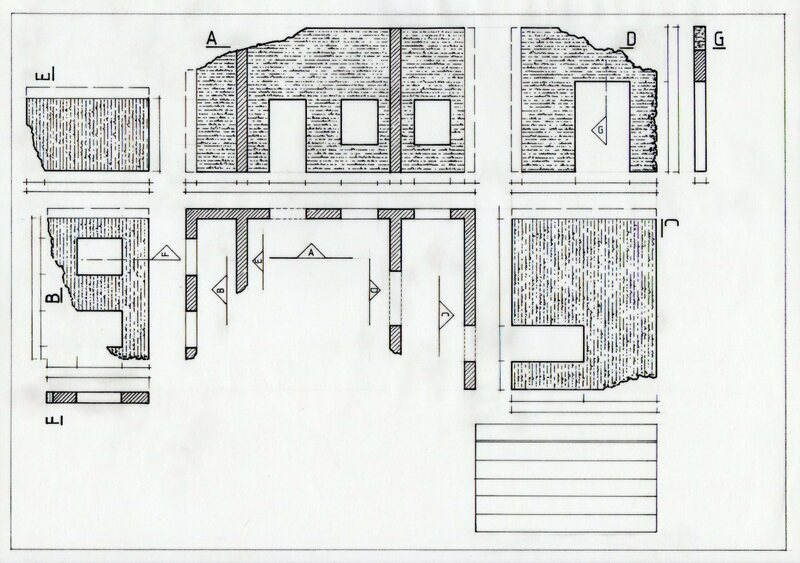 In the first part I finished with this drawing of a relatively simple brick structure, which represents many of the fundamentals of technical drawing and is conveyed in a style which is generally agreed to be appropriate to the purpose. The purpose of technical drawing is principally to provide clear and accurate information for making, but in many disciplines the technical drawings also serve other purposes. For example if the subject is a theatre set, or one for a film or a television show, the designer’s ground-plans become essential information used by almost all the other production departments. The set of drawings become a final ‘blueprint’ for the physical/spatial practicalities of the production including for example stage-management and costing. But as I also pointed out, the designer will often find that measured drawing is an essential tool for ‘working out’ the design even in a rough way during the early stages, often in close coordination with a scale model. The object above doesn’t bear much resemblance to a theatre set .. for one thing it’s a solid object rather than a space, so it’s viewed from the outside rather than the inside. However, the principles for drawing a spatial design are much the same .. just the arrangement of views is likely to be different. Here is a somewhat ‘stripped down’ drawing of a setting .. part of a derelict house. I’ve omitted text and measurements partly to focus better on arrangement. The most important and influential feature of a technical drawing is its layout .. the arrangement of views of the object and other parts of the drawing. The views of the object itself are the most important and everything in the arrangement should emphasize this importance, for example the other ‘parts’ such as rows of measurements are kept at a respectful distance and the views themselves are not generally disturbed with text or too many other lines unless there’s no alternative. The arrangement of the views on the sheet is also a prime device in understanding them .. they are aligned with each other so that one can directly relate an elevation, a wall seen upright, with its place on the ground-plan next to it. In this sense it really is like ‘reading in three dimensions’ .. turning in a virtual space! Unlike a solid object, a room seen from within can be flattened out like a cardboard box, as above. 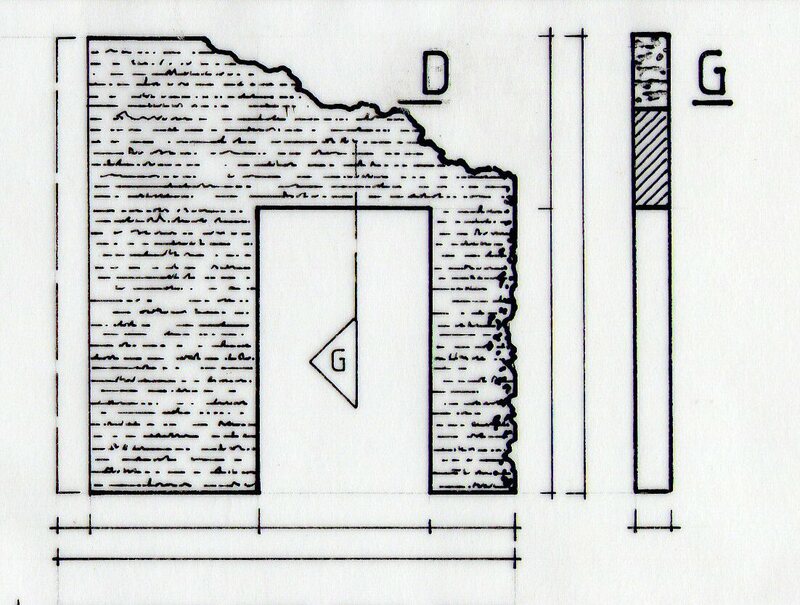 In this example, at least the three main walls can be laid out in direct relationship to the ground-plan. The other two inner walls also need elevations to describe them but these need to go somewhere else. Ideally these should be positioned where they line-up with and directly relate to something else. This usually means that some measurement lines can then be shared, which helps to reduce the clutter! When I say ‘line-up’ I really mean ‘have the same spatial orientation as’ and the same relationship to the floor plane. For example with wall ‘D’ I had the choice of either lining it up with wall ‘C’ or wall ‘A’ .. but the relationship with wall ‘A’ is a little more direct and .. very importantly .. it gives more space to include the cross-section view ‘G’ with it. Just briefly at this point .. because I will be dealing with this in more detail again .. you will have gathered that the overall layout of the sheet is not something that happens all by itself but something that needs to be carefully designed! But often the most effective layout is only apparent after all the elements required have been drawn up! There are various ways of ‘rehearsing’ what to do, and this is a separate subject for later. I called ‘G’ a cross-section because this is a more familiar and descriptive term but in technical drawing these are commonly just called sections. They show the structure, or part of it, sliced through at a chosen point. 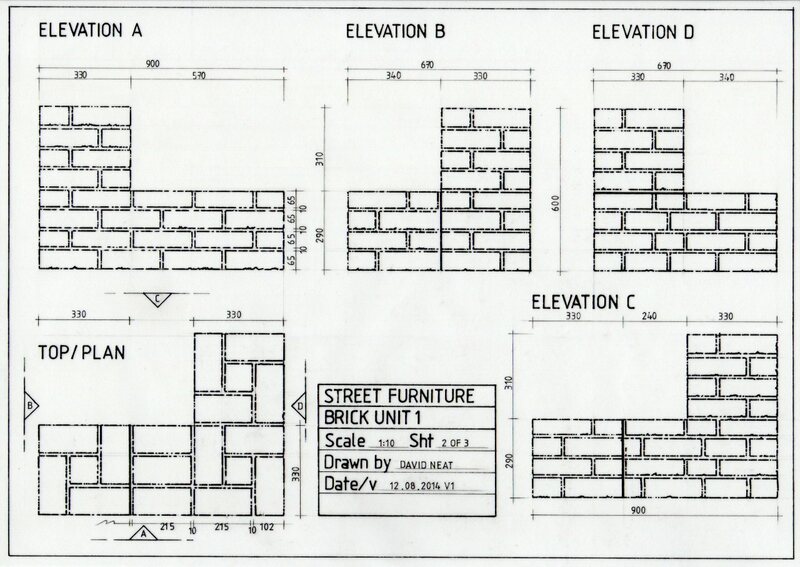 This often provides valuable information which is not immediately clear from reading the ground-plan and elevation. 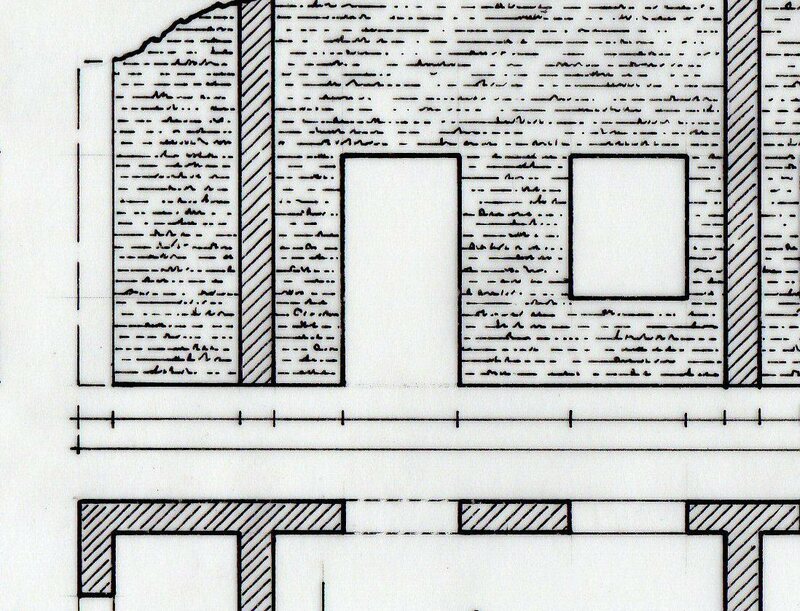 In the case of ‘G’ it is just a simple wall of even thickness, which could be guessed from the ground-plan, but at least the section confirms it .. sections are often just there to confirm. Sections become more crucial when the wall has more to it .. i.e. a window structure, door frames, decorative profiles etc .. all of which benefit from being described in cross-section. Everything ‘cut through’ is commonly represented in bold line and filled with diagonal hatching. Close, repeated diagonals make a lot of sense because these areas are then distinguished from most else that’s likely to be in the drawing. But there’s a very human, historical aspect to this custom of hatching .. the lines relate to the marks made in wood when it’s sawn through. In Part 1 I explained the value of pinpointing both the direction and the position of view for the different elevations by means of arrows surrounding the ground-plan, each enclosing a letter which corresponds to the drawn view. For the section shown above this is clearer. Look at the arrow with the ‘G’ inside it .. the dashed line shows the exact position of the ‘cut’ and the arrow shows the direction from which we’re looking at the cut face. It’s also accepted that what’s drawn in the section is not only the cut surface itself but also some of what we see beyond it, to keep its context .. hence in ‘G’ the lines underneath the hatched area represent the side of the doorway we would see and, above, the broken top of the wall. One could describe the use of letters to identify the views and the link to the arrow symbol as a method of ‘labelling’, but in technical drawing this aspect is commonly known as coding. The ground-plan is rarely as simple as the one above, especially those that are meant to serve as the ‘master’ ground-plan for a set. These may need to show how other overhead elements, such as flying bars or lighting rigs, relate to what’s on the floor or show the position of floor openings etc. .. but this simple one will serve for the moment to illustrate a number of additional principles in technical drawing. The ground-plan is also a form of cross-section. It’s not usually stated on the drawing, because this is another of those ‘agreed assumptions’ introduced in Part 1, but the ground-plan is actually a ‘view’ cutting through the whole at about the eye-height of a person in the space. The reason for ‘eye-height’ is that it gives us more significant information concerning doorways, window openings etc .. a viewpoint of ‘most information’ in other words. This is not strictly adhered to because, as I will show, information is often included relating to structures above this viewpoint and it doesn’t mean that everything in the space needs to be faithfully ‘lopped off’ at the same height. If it can be called a rule .. it’s a loose one. But the eye-height view means that generally window openings are cut through at an informative point. 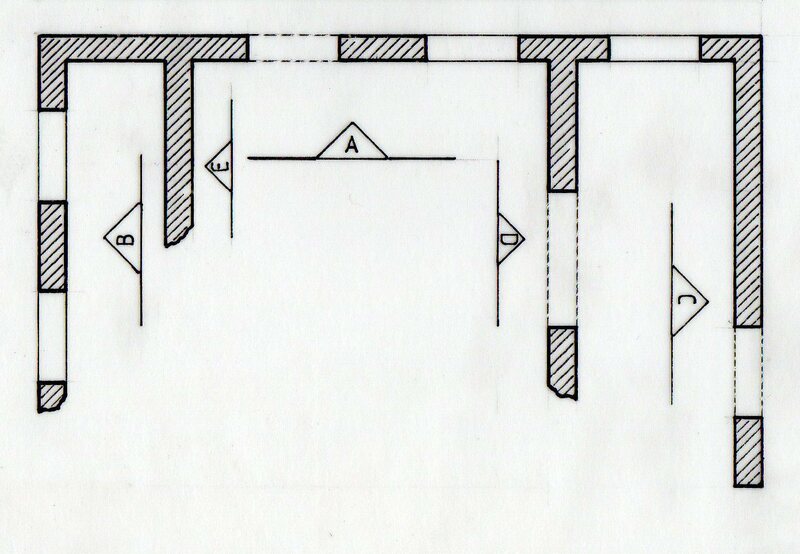 If there were proper window frames in this example we would also see these constructions chopped through, which would tell us the position of the window frame within the wall, the thickness of the struts and even the position of the ‘glass’ if the drawing is that detailed. In this example all we see when we look down are the wall edges making the bottom of the window opening and we see these as unbroken lines. We don’t see those unbroken lines when it’s a door opening because there’s most often nothing there below except floor. But with doorways it’s also customary to indicate that the wall continues solid above the doorway and that’s the reason for the dashed lines included here. This is one example of including so-called hidden lines, which are always either dashed or sometimes dotted, and include properly ‘hidden’ i.e. important structural lines which would not otherwise be actually seen because they’re masked by something and also, as in this case, structural lines which are above or behind the point of view taken by the drawing. There’s a difference between the detailed ground-plan views of separate set elements described above and the more general, overall ground-plans which aim to put the whole design in context. In the theatre these overall ground-plans .. sometimes called ‘master’ ground-plans .. show how each set fits into the architecture of the stage and should be drawn directly onto printed transparencies supplied by the theatre. If not supplied, the theatre architecture needs to be traced from a paper copy. This ‘putting in spatial context’ is no less important in film work .. for example if a set is to be built in a studio space. Technical drawing is much like driving a car .. anyone can learn how do it properly because it involves more knowledge than actual skill, though it really does help if you have the right ‘mindset’ for it .. and, at the very least, the ability to concentrate! Car driving shouldn’t allow for too much ‘freedom of expression’ .. there are things that have to be done and things that shouldn’t be done. Nevertheless, often the driving style of an individual expresses their personality! Is it the same with technical drawing? How much room for choice is there? More importantly how much opportunity is there to be overtly individual, personal, creative, stylish, decorative .. even anarchic .. while still informing clearly and accurately? This is one of the aspects I’m most interested in and I hope to explore this, amongst other things, in later articles.